Johann Heinrich (Henry) Rolfes was my husband's 4th great-grandfather through my mother-in-law's Brunswick line. He immigrated to America from Germany in the early 1830s. After arriving at the Port of Baltimore, he made the journey to western Ohio, and settled in the newly-formed German-immigrant town of Minster. Henry married Maria Catharina Huessmann in 1836 and, in 1852-53, he purchased a fair amount of land in Auglaize County's Jackson Township, a couple of miles southwest of the Minster town limits. Until this past week, I had had trouble locating Henry and his family in the 1850 and 1860 U.S. Censuses. I decided to take a fresh look at the information I did have and try to search again. I made the assumption that he stayed in the general vicinity of Minster between 1836 and 1852. (And yes, I made the conscious decision to come back and search the 1840 U.S. Census; that census only lists the male heads of household, and, at the time, I didn't feel like looking through tick marks and trying to decide if I had the correct family). First, I manually read through the entire 1850 U.S. Census enumeration for the town of Minster itself. I did not find a family resembling the Rolfes family. There was no enumeration district known as Jackson, so I decided to check German Township's enumeration; German Township was known as such because so many German immigrants settled there. Plus, it is directly adjacent to Jackson Township, where I know they did end up. 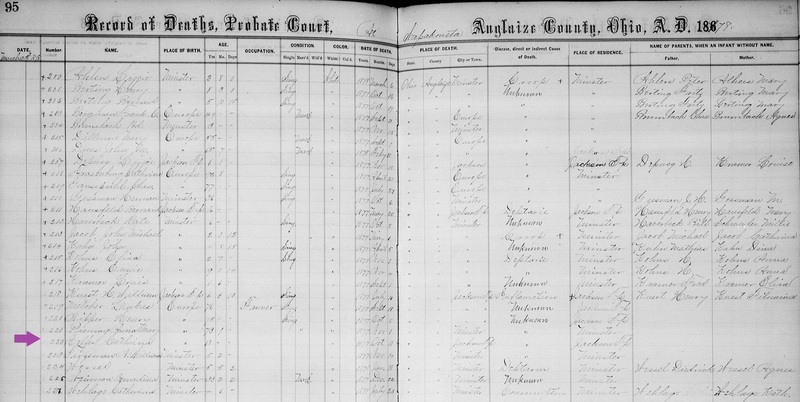 Finding the family in the 1860 Census was a little more challenging. By now, I knew that the family was established in Jackson Township, and I knew that I had combed through that enumeration section before. But, I went back and looked more carefully. There were not any families with an 'R' surname whose first names and ages even resembled the Rolfes family. But, I did find a family by the name of 'Wolfast' whose names, ages, and birthplaces fit. I went to Google Translate, selected German, and typed 'Rolfes' into the box. Then, I clicked on the little sound button in the lower right corner to listen to how Rolfes would be pronounced in German. And, let me tell you, with a thicker German accent, a census enumerator not familiar with German could very well interpret it as Wolfast. Take a listen here. I should mention that I'm not exactly sure who the ten-year-old 'Catherine M.' is in the family - it could possibly be a daughter or a niece I haven't yet researched. Henry Rolfes did not appear in any future census. He passed away in 1866. His wife, Catherine, went to live with her married daughter, Catherine Rolfes Prenger, whose husband was also a farmer in Jackson Township. The widow Catherine Rolfes passed away 11 Oct 1877.